Two veteran NASA missions are providing new details about icy, ocean-bearing moons of Jupiter and Saturn, further heightening the scientific interest of these and other "ocean worlds" in our solar system and beyond. The findings are presented in papers published Thursday by researchers with NASA’s Cassini mission to Saturn and Hubble Space Telescope. In the papers, Cassini scientists announce that a form of chemical energy that life can feed on appears to exist on Saturn's moon Enceladus, and Hubble researchers report additional evidence of plumes erupting from Jupiter's moon Europa. The presence of ample hydrogen in the moon's ocean means that microbes – if any exist there – could use it to obtain energy by combining the hydrogen with carbon dioxide dissolved in the water. This chemical reaction, known as "methanogenesis" because it produces methane as a byproduct, is at the root of the tree of life on Earth, and could even have been critical to the origin of life on our planet. "Confirmation that the chemical energy for life exists within the ocean of a small moon of Saturn is an important milestone in our search for habitable worlds beyond Earth," said Linda Spilker, Cassini project scientist at NASA’s Jet Propulsion Laboratory (JPL) in Pasadena, California. Cassini wasn't designed to detect signs of life in the Enceladus plume – indeed, scientists didn't know the plume existed until after the spacecraft arrived at Saturn. The paper detailing new Hubble Space Telescope findings, published in The Astrophysical Journal Letters, reports on observations of Europa from 2016 in which a probable plume of material was seen erupting from the moon’s surface at the same location where Hubble saw evidence of a plume in 2014. 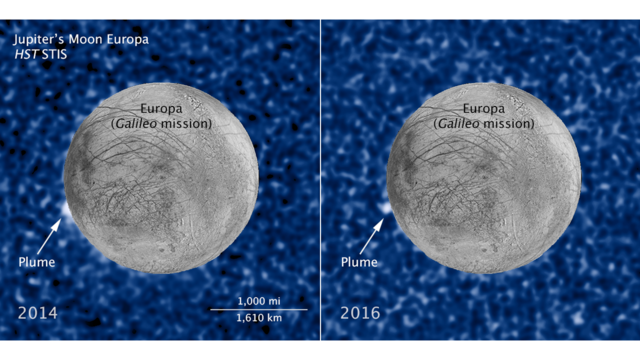 These images bolster evidence that the Europa plumes could be a real phenomenon, flaring up intermittently in the same region on the moon's surface. The newly imaged plume rises about 62 miles (100 kilometers) above Europa’s surface, while the one observed in 2014 was estimated to be about 30 miles (50 kilometers) high. Both correspond to the location of an unusually warm region that contains features that appear to be cracks in the moon’s icy crust, seen in the late 1990s by NASA's Galileo spacecraft. 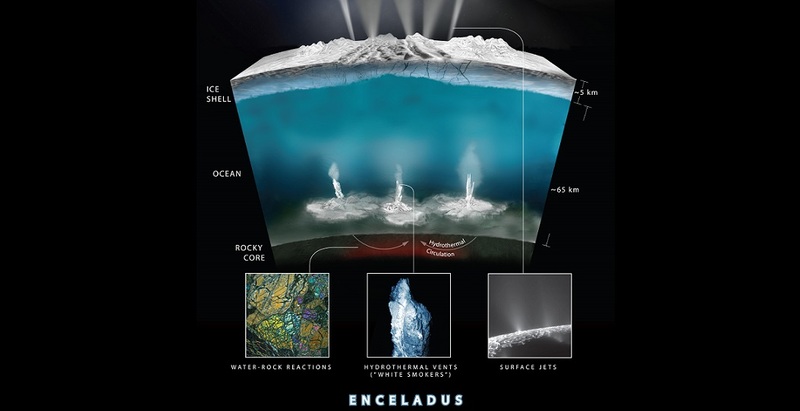 Researchers speculate that, like Enceladus, this could be evidence of water erupting from the moon’s interior. “The plumes on Enceladus are associated with hotter regions, so after Hubble imaged this new plume-like feature on Europa, we looked at that location on the Galileo thermal map. We discovered that Europa’s plume candidate is sitting right on the thermal anomaly," said William Sparks of the Space Telescope Science Institute in Baltimore, Maryland. Sparks led the Hubble plume studies in both 2014 and 2016. For both the 2014 and 2016 observations, the team used Hubble's Space Telescope Imaging Spectrograph (STIS) to spot the plumes in ultraviolet light. As Europa passes in front of Jupiter, any atmospheric features around the edge of the moon block some of Jupiter’s light, allowing STIS to see the features in silhouette. Sparks and his team are continuing to use Hubble to monitor Europa for additional examples of plume candidates and hope to determine the frequency with which they appear.